Freedom and Flourishing: Is Bitcoin better than gold? When suggestions have been made to me in the past that I should write about Bitcoin, I have expressed reluctance on the grounds that I don’t know much about it. Some would say, however, that is also true of some other things I write about on this blog. Time seems to be running out for me to write about Bitcoin while the topic is still interesting. I keep reading news reports suggesting that Bitcoin is rapidly becoming respectable. Apparently New York State’s top financial regulator has just granted the first license to a Bitcoin exchange. A couple of weeks ago it was reported that Goldman Sachs is making a significant investment in a Bitcoin-focused company. Anyone looking for a simple explanation of what Bitcoin is and how it works can find a fair amount of information online without much difficulty. The Economist attempted to provide an explanation a couple of years ago, but I found an explanation aimed at five year olds to be more helpful. A couple of months ago Nicolas Dorier referred me to the excellent explanation which Andreas Antonopoulos provided to a committee of the Canadian Senate in October 2014. Mr Antonopoulos also appeared before a committee of the Australian Senate and responded admirably to concerns about use of Bitcoin for nefarious purposes such as funding of drug trafficking and terrorism. He also argued strongly that incumbents in the finance industry should not be allowed to dictate government regulations applying to Bitcoin. Should we view Bitcoin as money? In order to look at this question it is necessary to consider three functions of money: a unit of account; medium of exchange and store of value. Some economists, including Scott Sumner, argue that the unit of account function is the distinguishing characteristic of money from an economic perspective, and I am inclined to agree. Bitcoin is not widely accepted as a unit of account at the moment - it certainly does not seem likely to displace national currencies in that role in the near future. However, Bitcoin seems to be proving itself to be very useful as a medium of exchange in international transactions. It is particularly pleasing to see reports of Bitcoin being used to enable guest workers from countries such as the Philippines to send remittances home to their families for a much lower price than is charged by firms such as Western Union. Further innovations are occurring in this area. For example, it has been recently reported that an Australian company, Digital CC, has set out to become the Uber of international transfers by developing a peer-to-peer transacting technology to allow remittance payments to be made via a mobile app. 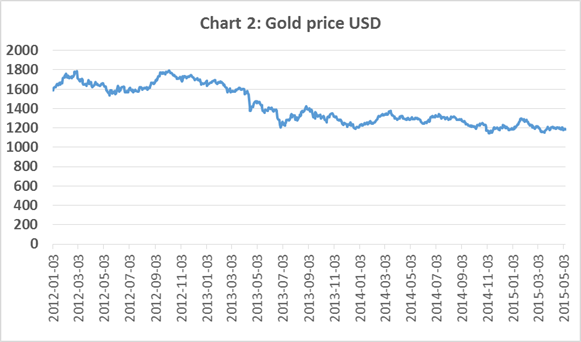 There is no question that Bitcoin is much better than gold as a medium of exchange, because gold is expensive to store and transport. It is when we consider the potential for Bitcoin as a store of value that the question of whether Bitcoin is superior to gold becomes harder to decide. A glance at the charts below might suggest that investors in Bitcoin are being optimistic if they think it will soon be accepted as a reliable store of value. 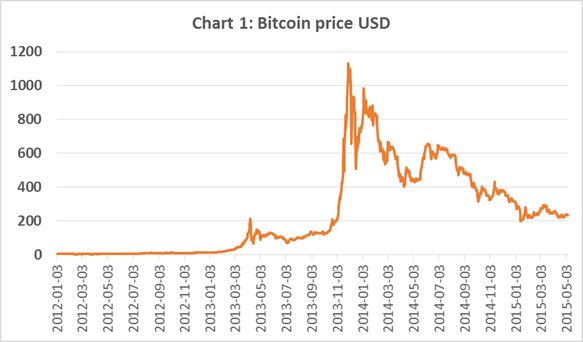 How much attention we should pay to past volatility in the price of Bitcoin in thinking about its potential as a store of value in the future? “Of course, as a new technology, bitcoin is subject to much more volatility than gold. But over the long run, given the fact that no new bitcoins will be mined after the 21-millionth, we can expect it to ultimately serve as a better store of value than gold”. I feel inclined to agree. However, the more difficult question for me is whether to put my money where my mouth is. "There is nothing to to fear about Bitcoin, but like owning gold, if your lose the map where you buried it, you lose everything. So one should be confident in his ability to protect the map. To learn how to do so, one should start training by protecting some pocket money first before burying his treasure. First, start small, and consider it a learning experiment rather than an investment. Bitcoin is relatively new, and the tools and ecosystem are not as user friendly as they will become. The learning curve might be a little steep. Owning Bitcoin means being responsible for your money, and most people are not responsible of their own computer. So be careful, you can always try to buy a few (for 10-50 dollars), and play with it by trying to buy stuff, transfer them between addresses, backup them on paper etc, restore them etc. This stuff was easy to learn for me as I am a developer. But it is not for most people. Second, never let your bitcoin on fiat/bitcoin exchanges once you bought. You don't own bitcoins if you don't own the private key. Any balance you see on exchanges are just IOU, not bitcoins. By playing with it you will learn little by little all what you can do with it that you can't with traditional fiat currencies, and all the business opportunities that it opens. But don't rush it, start playing with it first. Bitcoin is also an hedge against monetary mismanagement and financial oppression, a typical example right now is Argentina. As the failure of our central banks becomes more and more obvious, they will start to impose capital controls. (War on cash, that you start to see happening everywhere). This is mainly what will ultimately drive the value of Bitcoin."